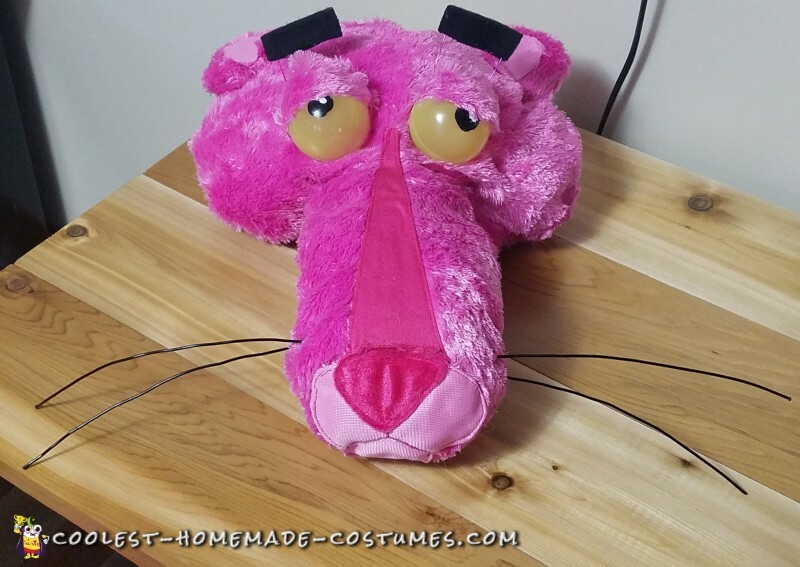 I finally got around to making the costume I’ve always wanted to make…The Pink Panther!! I have wanted to for years but just didn’t have the time and finally ordered the material and set to work! 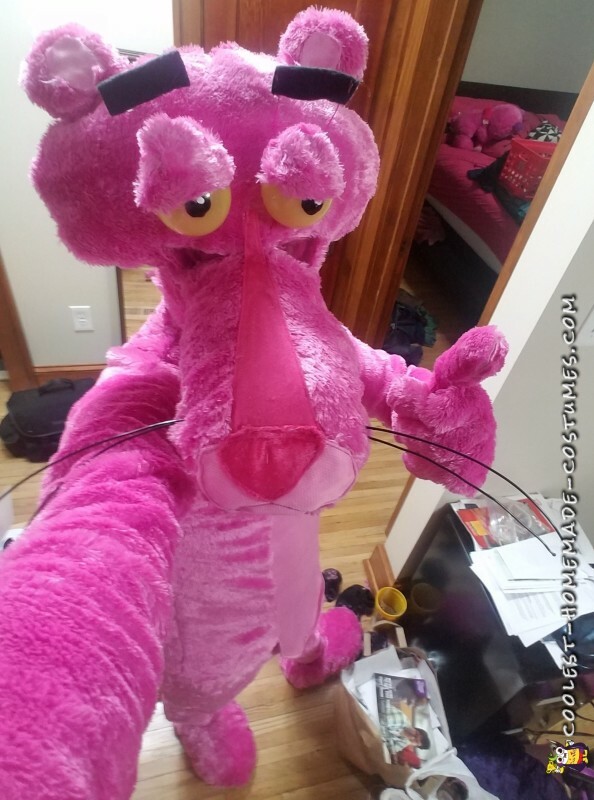 So, I really don’t have any specifics on how I made my pink panther costume, it was literally all from scratch! 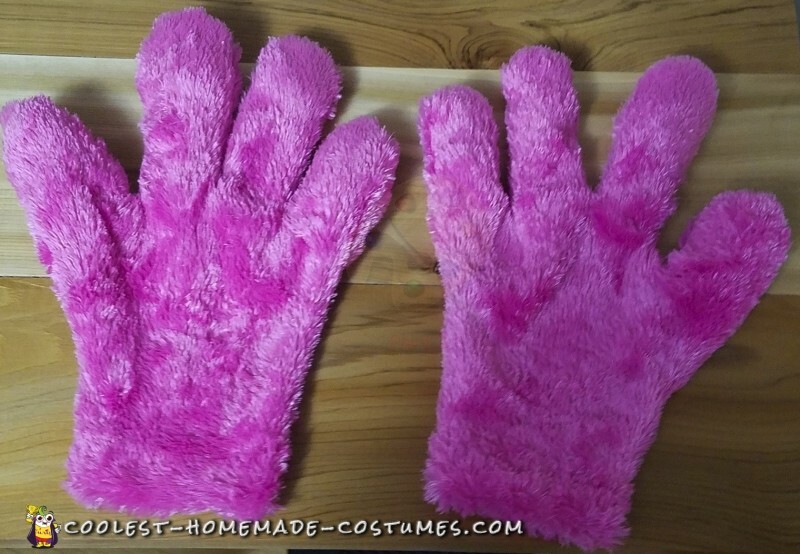 From the feet, to the legs, tail, top and head, everything was cut and sewn all from scratch. The head was definitely the most difficult part but after having made a Roger Rabbit costume from a previous year it was the same type of concept, cut and pray it all goes together! Haha. I cut both the pants and shirt somewhat tracing off of a pair of pajama pants and a t-shirt. The belly of the top is the same with the belly being the same furry fabric flipped inside out. 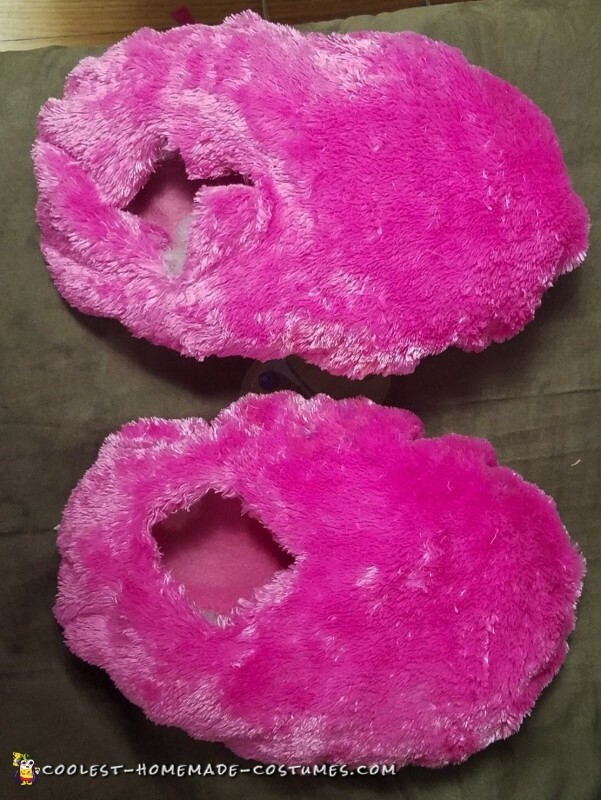 The feet are just freehand cut and sewn filled with fluff. In addition, I used some slippers inside so they are comfy to wear! The hands were the same way. I just traced out my hands and made them a little bigger, added some fluff to filled out the finger. The head being entirely cut from scratch was just using my creative mind to give it the proper look. In addition, I added some small pink mesh so I could see. The eyes are some plastic ornaments I painted yellow, and the eyebrows I used some black fabric attached to thin pink wire to make them look like they’re floating! Also, I filled the top with more fluff to give it the full look of his head. In order to make the nose, I cut it all freehand and then sewed and hot glued it on. Also, the whiskers are just some black crafting wire run through the nose. After a few long nights and lots of sewing I completed this year’s awesome costume!! If you’d like to know more about how any of it was made or what I used, don’t hesitate to ask!! 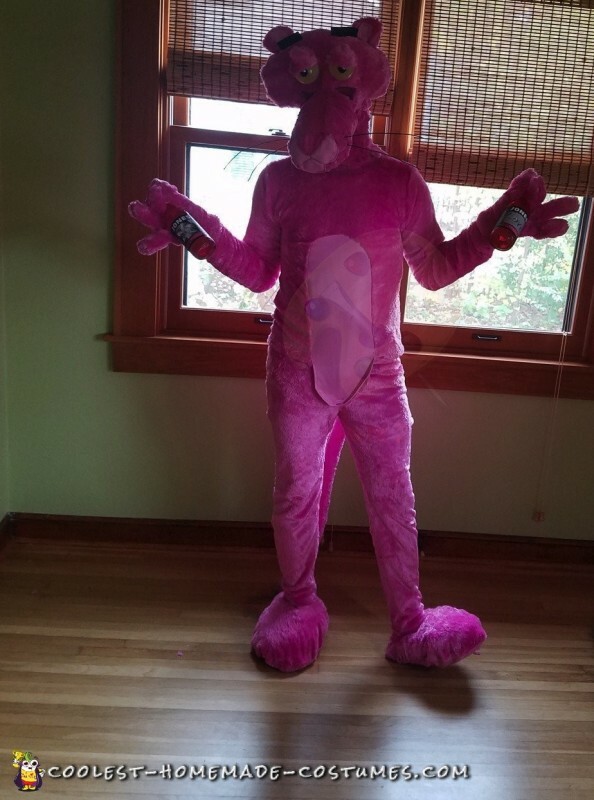 My goal has just been to make awesome costumes that make people laugh and smile and enjoy Halloween! So hopefully this year is no different!! And you can’t have the Great Pink panther without the Inspector! 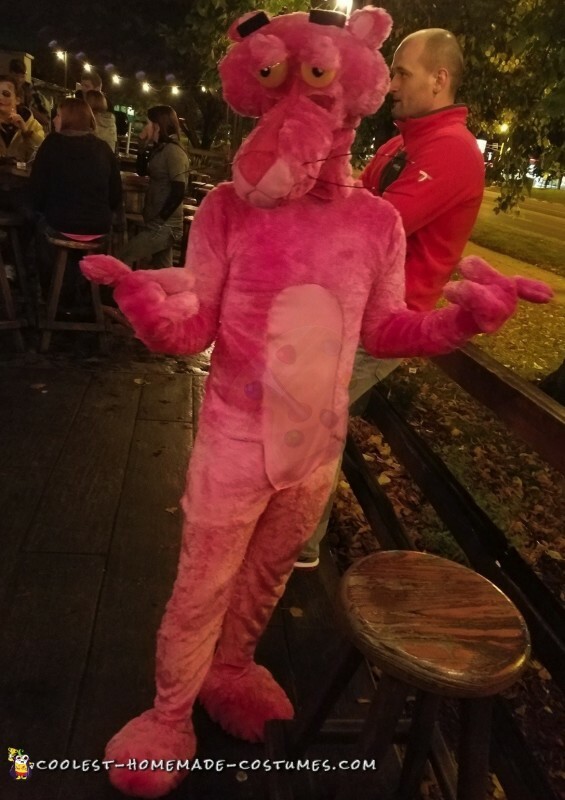 Hope you all Enjoy this years Epic Pink Panther Costume!! Thanks and Enjoy!! 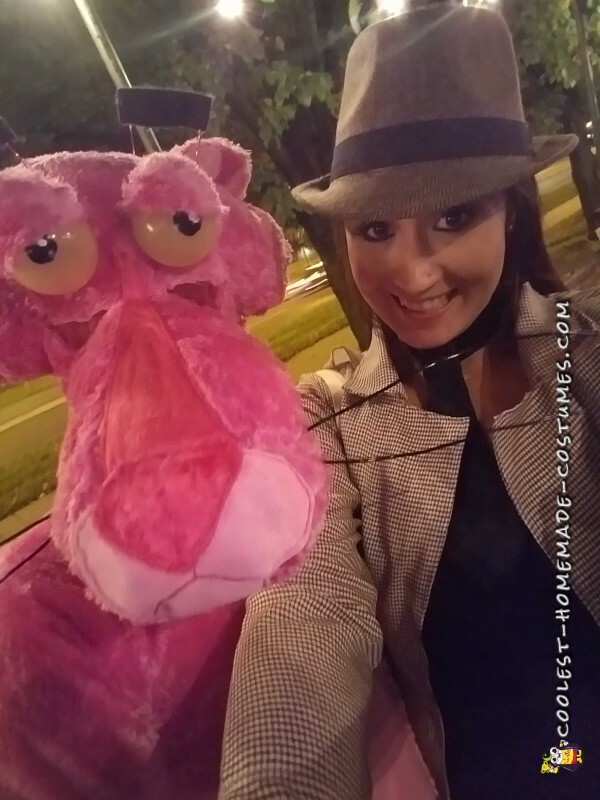 From, Nick AKA The Pink Panther!